“Since Santorini is unique, with its unprecedented level of individuality, I guess that what is coming next is not another island… but the Islands. Consumers associate the Greek Islands only with positive images and not unduly so. What needs to be highlighted is that Cephalonia, Crete, Tinos, Paros, Samos, even Milos and Syros not only have much excitement to offer, but also make some of the best wines in Greece. Look out then for The Islands as a new category’’. Among these Cephalonia, Crete and Tinos already possess a combination of impressive terroirs and indigenous varieties, together with a number of quality - driven producers who craft wines of purity, intensity and elegance. Wines that are expressive and have true personality. Howerver, Tinos is a remarkable example. 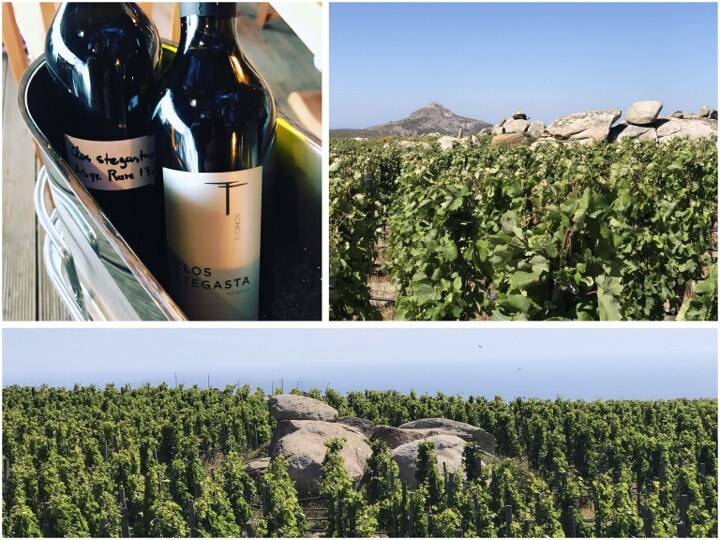 When I first visited the island two years ago, I wrote about the mystical, moon-like, terroir of Falatados, and the famous round granite rocks that are found in the vineyards. Many theories have been postulated; these rocks, called volakes, are the remnants of a mythical battle between the Gods and the Giants, or they resulted from a meteor shower. According to geologists however, these granite rocks were formed 15 -25 million years ago due to changes in temperature, humidity and friction caused by the wind, thus they eroded and developed their current spherical shape. And what about the wine scene on the island? The producers on the island have now risen to six, from four two years ago, and there are one or two more in the pipeline. This confirms the huge dynamic of the island. This impressive mixture starts with T-Oinos, a cult winery, of rising status, consulted by Stéphane Derenoncourt. I revisited the vineyards (pictured below) around noon and was greeted by the agronomist Michalis Tzanoulinos. “When we started this project almost everybody thought we were crazy; that we were trying to accomplish the impossible. This is partly true. We superseded logic and I think that both we and the vines made it. We started from scratch, on abandoned soils, building xerolithies…’’ he says as we walk among the extremely densely planted vines. “This is very labor intensive viticulture and we are the only winery to practice it; we treat each vine as if we were father and child,’’ he continues. Experience from the previous 16 years helps. Pest management is not a major issue with few some isolated cases of oidium worth noting. 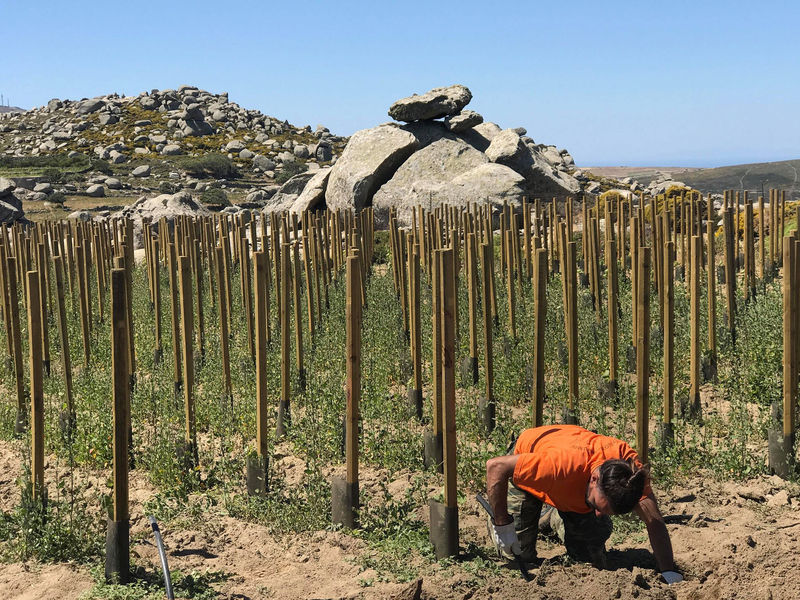 The soil is very carefully handled and the canopy reaches 1.80 m. “There is no need for de-leafing and we aim for 5-6 bunches per vine,’’ Anzoulinos explains. T-Oinos now covers 11 hectares of vines and their target is to reach 13 ha within a period of two years. The winery is currently the leading producer of the island. Nevertheless, production is a mere few thousand bottles, starring the stunning Clos Stegasta Assyrtiko and Clos Stegasta Mavrotragano; now they include a more premium bottling called ‘Rare’, which takes complexity to another level. Toinos vinifies in its own winery in Falatados. When I first met Jerome Binda from Domaine de Kalathas I named him the “Crazy French man from Falatados.’’ When I met him again, a couple of years later, he was still crazy. And a little wiser, I guess. The vineyards he owns cover approximately 1.1 ha and among these he has quite a few experimental patches. Nevertheless, in total he works he 2.5 ha, together with the land he contracts. He places emphasis on local grapes, such as Asrpo Potamisi, Mavro Potamisi and Koumariano, but also grows Mavrotragano, Syrah and Serine from Cornas, along with Mandilaria and Assyrtiko. He started with 2.500 bottles in 2015, 4.500 in 2016, whereas in 2017 he produced 8.500. I tried to make some small videos of him, but unfortunately the fierce wind that was blowing did not allow that, so I am quoting his most important views. Binda works mainly with local grapes and he is very fond of Aspro Potamisi in particular. “I like Aspro Potamisi of Tinos very much, and I am privileged to be working with some vines that are up to 250 years old…’’he confesses. He still sees himself as a debutant and he is convinced that when we talk about natural wines “everything takes place in the vineyard…’’ He explains that the core of his philosophy is minimal intervention, ie. no treatments, no additions. He describes his thoughts and actions under the “life in winemaking’’ holistic approach. His wines are very distinctive, scarce and full of attitude and personality, expressive of places that possess unbelievable energy, as is that of Kalathas. As of the 2017 vintage, Binda vinifies in his own garage winery (pictured below along , in fully sterile conditions, so as to avoid any spoilage contamination. The third producer of the Falatados terroir is Volacus; the family business of Michalis Kondizas and his wife Eirini. Perhaps his terroir is equally impressive, if not more, to that of Toinos or Kalathas. Malagousia is planted, in terraces, at 440 m altitude (pictured below), with scattered volakes in between. As we drive to the vineyards he reveals his wine dreams. “I had a crucial decision to make; I had to choose between buying land or building a winery. I chose the former investing in 10 ha of land! I believe that Tinos is very unexplored, and I am willing to go deeper into this wine adventure”. Volacus currently produces 3.000 bottles, which are comprised of 1.800 bottles of Malagousia and 1.200 of Assyrtiko; the latter was recently introduced to the market. “I’m aiming for 4.500 bottles this year, if all goes well, and in addition to Malagousia and Assyrtiko I also work with Mavrotragano and Rozaki. It is difficult to make ends meet, as a lot of personal work is needed, but I hope that the whole venture will be profitable in 3 years time” he confesses. We taste the two whites, under the shade of an old plane tree, and I am blown away by the definition of the Malagousia which is floral, fresh and salty, and the potential of the Assyrtiko. Kondizas vinifies at Christou Fonsou winery, the oldest winery of the island, established in 1997, but uses his own equipment. Yet, there is much more to the island than Falatados; there is immense diversity in its terroir. Just a few minutes drive from Falatados, the soil composition changes completely. 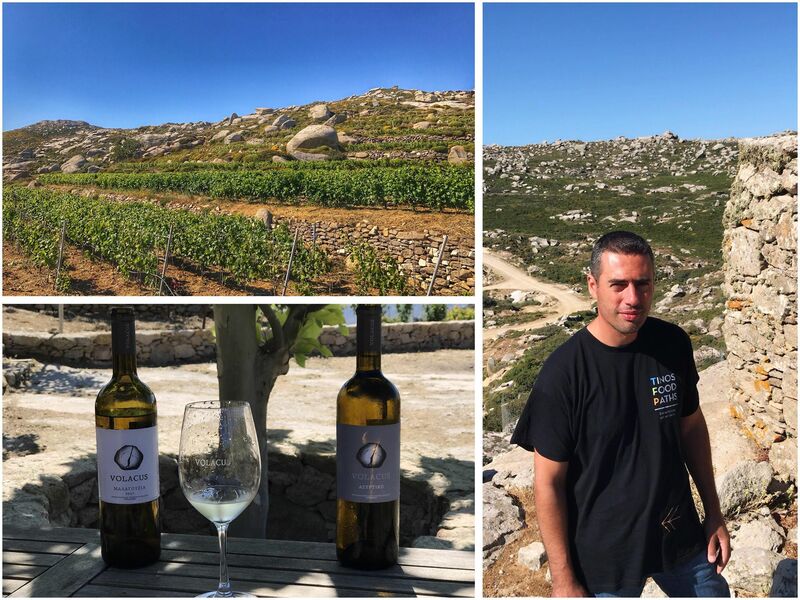 Yiannis Moraitis Vaptistis from the Vaptistis winery explains: “We are located between Steni and Mesi, at 440 m altitude, a totally different terroir comprised of a schist soil locally called kagias. 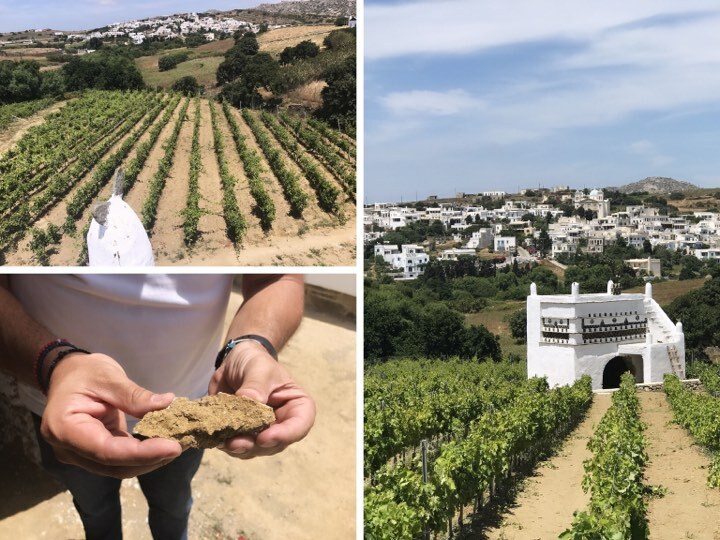 There is also a third terroir at the south eastern part of the island which is a combination of sand and clay, is sunnier and gives earlier ripening grapes.’’ We walk around the traditional pigeon house of the family where the first vines of the family were planted in the 50’s. “It is a new project currently in its third vintage, and taking into consideration the positive feedback we've had, we will increase production to 10.000 bottles from 5.000 in 2016’’ he comments. 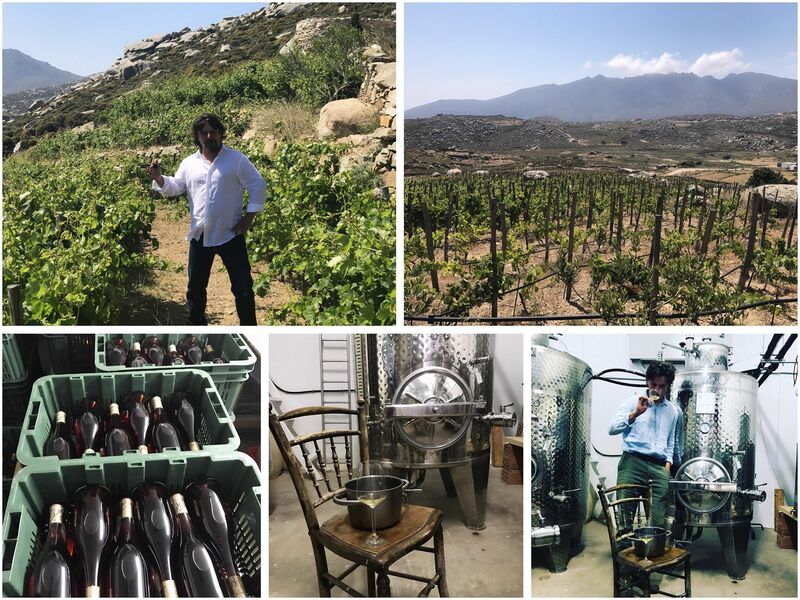 Moraitis vinified in Santorini until 2017, but his new winery is almost ready and he is hoping to start there from the upcoming vintage. His two wines are blends based on Assyrtiko and Mandilaria with a fruity core and a certain level of elegance. However, he also supports plantings of Potamisi, Koumariano and Rozaki. “It will be interesting to see how they will be expressed. My philosophy is based on having a business with artisanal products and on trying to highlight the inland terroirs of the island. Paying respect to tradition and my roots’’ he concludes. West of Falatados, one comes across the Exomvourgo hill (pictured below), which rises up to 641 m – a setting that looks as if it just stepped out of the Game of Thrones. A huge granite boulder formed of igneous rock, that dominates the center of the island and is the location at which the medieval capital of Tinos, the Castle, was once built. 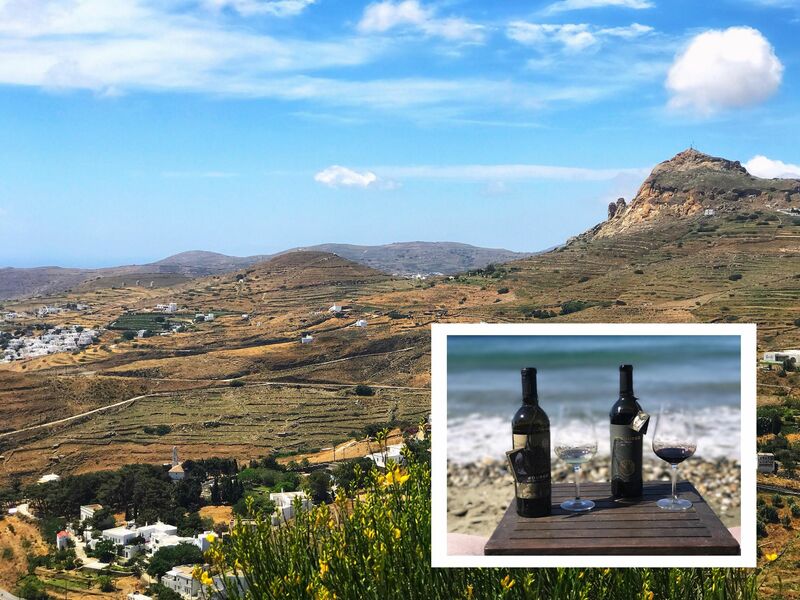 At its foothill one sees the Tripotamos vineyards, the latest addition to the mosaic of Tinos. Entrepreneur Theodoros Kosmopoulos passionately cultivates 0.8 hectares, spread over 11 terraces, at 350 meters altitude, with a density of 7.000 vines per hectare. We met at the cult Marathia restaurant and he spoke of passion, symbolism and his devotion to this kind of life. “2017 was my first attempt at wine-making and I produced just 2.300 bottles, 1000 of Assyrtiko and 1300 based on Mavrotragano. I am proud of this and hope I can assist in the stir the island is causing…’’. The X-BOURGO wines confirm the great dynamics of the island, and add another piece to the wine-making puzzle of its producers and styles of wine. The Assyrtiko is impressive, with exceptionally pure fruit, the typicity shown when it is island grown, together with stunning complexity. The red wine, which has 70% Mavrotragano in the blend is a fascinating, textural wine, with fine crafted tannins and a solid umami character. Yet, this is only the beginning for Tinos.